I'm Chelsea Donaldson and I am a fourth year teacher. I teach in a digital 1:1 learning environment and am passionate about using technology to engage and extend my learners. I'm all about making my lessons engaging and fun, and creating a safe, inclusive and happy classroom. 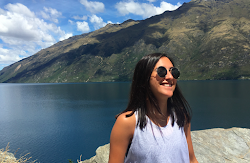 This year I am teaching an awesome class of year 7 & 8 learners at Glen Innes School, and documenting my learning along the way. Team building activities are an essential for the beginning of the year, especially with upper-primary/intermediate students. 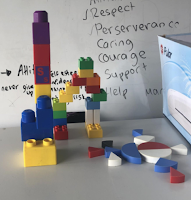 It is a chance for students to make connections, collaborate and realise their potential as confident and capable members of the classroom. Every year I use the same words when beginning this fun team building unit - safe, inclusive and fun. I strongly believe that if a classroom is safe, inclusive and fun, then learning and achievement will come naturally. A happy student is a student who will feel ready and motivated to learn! 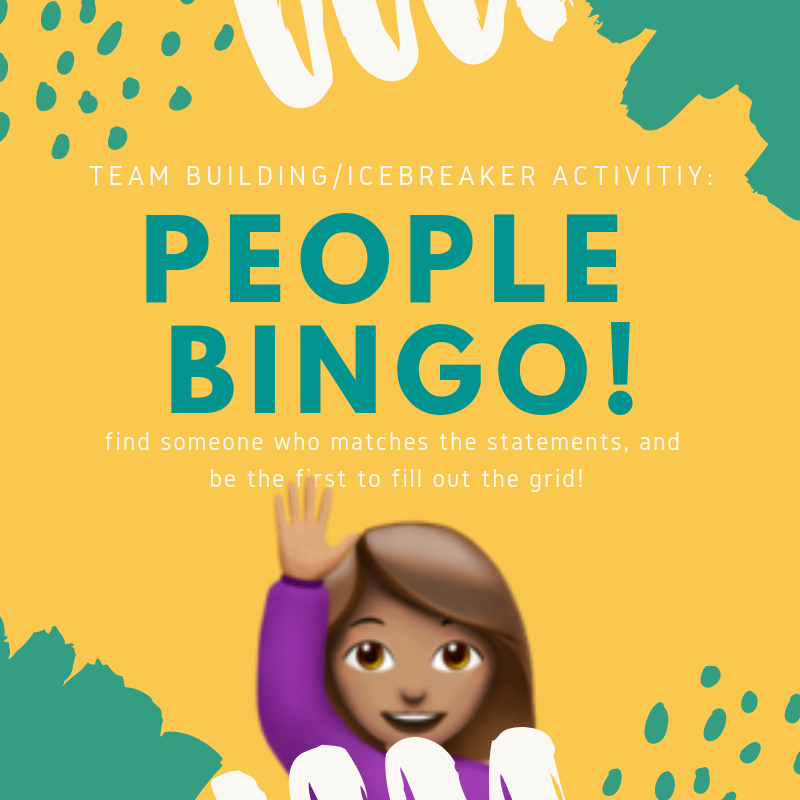 Since I had a feeling my students would need a little push to interact with each other, I decided to use a ice breaker activity that would literally force them to talk to everyone on day one. I created a 5 x 5 grid and came up with a bunch of statements about students likes, dislikes and hobbies. I purposely used a 5 x 5 grid so students would practically speak to everyone (there are 27 students in my classroom). Instructions: Students need to roam around the room and find someone who matched the statement. Their challenge was to dill their entire grid, and only have a persons name once. Duration: 10 - 15 minutes. 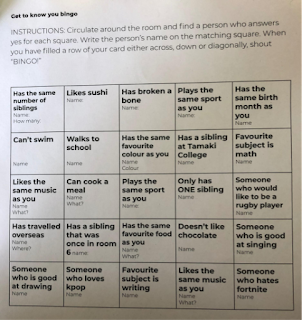 Adaptations: this activity usually calls for students getting 5 names in a row, however I wanted to force them to speak to all of their new classmates. Also, because I knew some would be shy, I allowed them to choose between working with a peer or by themselves. This really helped my introverted students, as having a buddy gave them more confidence to approach their new classmates. The verdict: Students started off pretty quiet, so I had to be patient with this one. 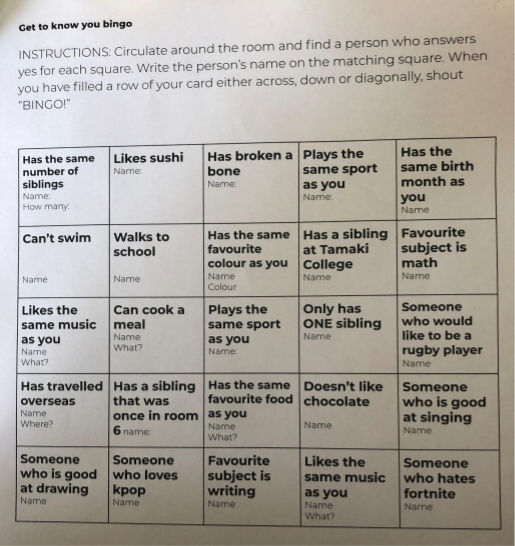 After about 3-5 minutes, students had already asked their 'friends' to fill in their sheet, so they had to start asking people they didn't know. About 10 minutes in the class was buzzing with movement, chatter and giggles. If you have patience and keep encouraging your students (and hyping them up!) to take risks and speak to everyone, this is great for to use for your very first ice breaker. 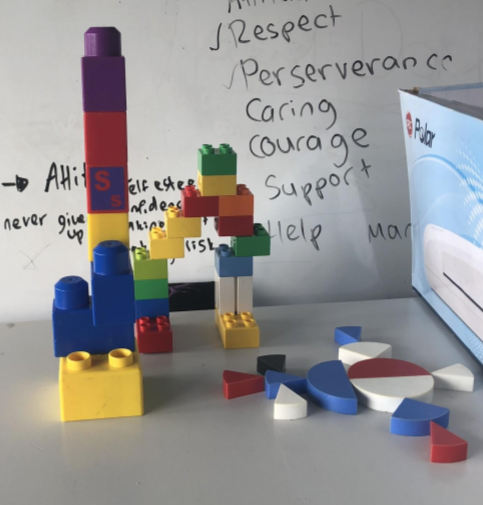 Create a structure (or series of structures like I did), and place it somewhere that the students can't see from their workspaces. In groups of 4, students have to work together to recreate the structure, making it exactly the same as the example. Instructions: One at a time, a student may look at the example structure for 5 seconds. The catch is, if they are the one that has looked, they cannot touch their blocks. Students will have to use their memory and communication skills. Duration: Around 15-30 minutes, depending on your students and the types of degree of difficulty of the structures. For my class, this took just over 20 minutes for three groups to finish. Be more flexible about the choice of colours of the blocks. Have less structures, or more simplistic ones. Add additional blocks to their piles so students are not sure which ones are needed and which are surplus. Set a time limit to add more pressure. Make structures more complicated and involve more pieces (I was restricted by the number of blocks I had). The verdict: this activity was so much fun! it was great to see students using their communication skills with their teammates, and coming up with strategies to make their structures the fastest. 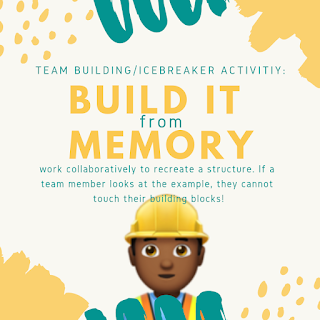 This activity does require a lot of teacher preparation, as you need to make sure that each student has the same exact blocks to work with. This is activity is a class favourite! You will need to find a simple drawing for your class to recreate. Each group (4 students only) will have a print out of the drawing, their own A3 paper and a felt pen with four strings attached. Instructions: Each student must be holding onto the string. 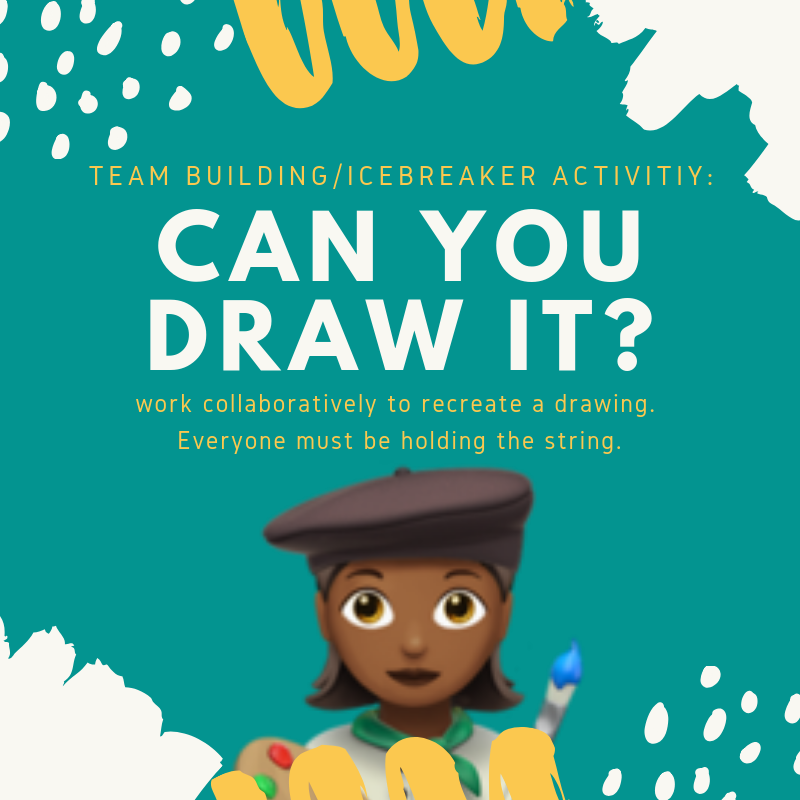 They need to communicate and work as a team to complete their drawing. They are not allowed to touch the felt, and all four students must be taking part and holding onto a piece of string. Duration: depending on your students and the drawing you choose for them, it could take between 5-10 minutes. This a quick but super fun lesson! You could draw it out for longer by stopping part way through and having a discussion about why some groups are more successful than others. Securely tie the strings to the felt pen (I didn't do this because I wanted the students to problem solve and work collaboratively, as if one student pulled up too fast then the string would come off). Get them to write TEAM or TEAMWORK instead. Don't give students any guidance or tips. Give your students the tools and ask them to figure out how to assemble the strings so they are controlling the felt pen but not touching it. Another classic team building activity. You will need a large playing space (indoors and outdoors works fine!) some obstacles for students to avoid and some blindfolds. 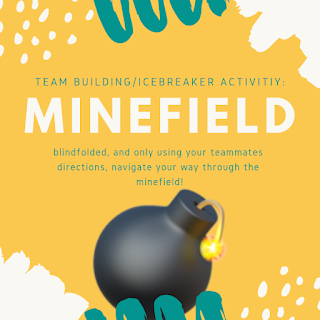 It can also be useful to have a minefield for each group so that more students can be involved, and to add a bit of friendly competition! Instructions: Students get into small groups and wait at the start of their minefield. One at a time, a blindfolded student will attempt to make their way through the minefield. Their team members will need to give clear, simple and careful instructions! Have tarpaulins (or something similar) to crawl under. The verdict: this activity is great for building students communication skills and trust. This is heaps of fun and is a good way for students to take risks and trust their classmates. My students also enjoy making it into a little competition with the other groups. I am a Google Certified Educatir! Grow Your PLN with Twitter! Is your default the way you learn OR the way your learners learn?